When Jude recently asked me start writing some stories for DAB, he thought it might be beneficial for folks to get a sense of my “downtown history” from the perspective of a local retail business owners’ leasing odyssey over 16 years. OK, here goes! 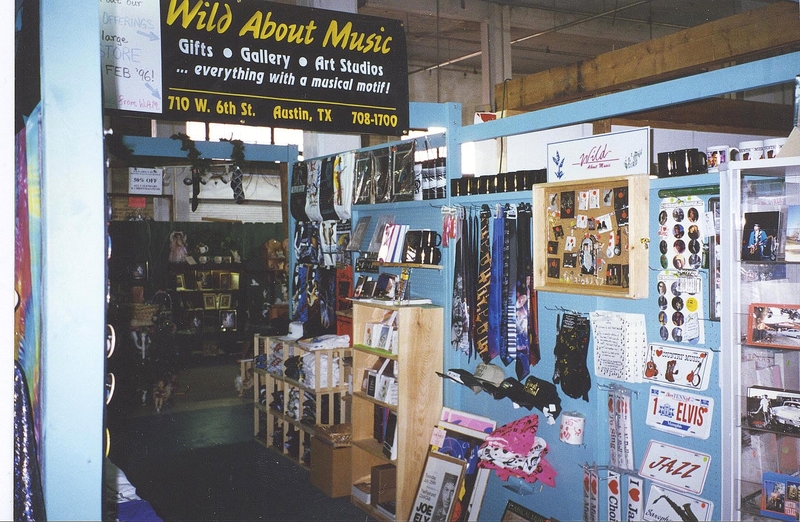 I’ll stick with the angle of space and location because you can find out more about the business itself, Wild About Music Art & Gift Gallery (WAM), by stopping in at 115 E. 6th, across from the Driskill Hotel, or checking out our fine website here. My partner, Shelley Meyer, and I started out in 1995 by buying the name and assets of a tiny sole-proprietor hobby business located inside the old Bluebonnet Market on the NW corner of Neches and East 3rd. A late-90s expansion of the Convention Center resulted in demolition of the Market which stood right where Exhibit Hall 4 is today. We took that little 200-sf booth and set out to expand it into our vision of a 5,000-sf all-music-themed art and gift gallery, plus office and warehouse space. We knew we wanted the business to have a heavy Austin and Texas flavor — to celebrate the confluence of art and music in this region and its influence on local culture. As a dedicated “urban retailer” we wouldn’t have anything to do with malls or strip centers. We required authentic vintage buildings/spaces with a more natural local vibe. Downtown has always been the only choice for us, no matter what the challenges have proved to be. Ironically, even though WAM’s heart and soul is grounded in music, we wanted nothing to do with East 6th Street at the time. We had watched it decline in the late 80s and 90s to a cheesy array of shot bars raided by late night college kids and mostly vagrants wandering the blocks by day. So our first stop was 710 W. 6th, the building where J.Black’s and The Ranch reside today. We figured we’d still catch some of the global “Sixth Street brand” cachet but stay away from its problems by being west of Congress. With a 5-year lease in hand on the long vacant former furniture store, we rolled out a fun piano keyboard entry foyer handmade with one-inch tiles, dressed out the big display windows mighty fine, filled out five giant rooms full of the coolest art and sculptures you’d ever seen, hung some outdoor speakers to lure in passersby, and waited for the customers to show up! We waited alright. For a year we watched the cars stack up out front with the backup at the Lamar traffic light. We soon realized we were about a decade ahead of “the scene” forming in that neighborhood. There was only Katz’s, Opal Divine’s Freehouse and us at the time. Oh yes, and Leslie making visits to the MHMR clinic across the street where Molotov now burns red hot. There was supposed to be a big retail center going in where Whole Foods stands today that would help bring more shoppers to the area. Never happened. We knew we were doomed unless we got the heck out of there fast. Fortunately my longtime commercial real estate agent, Don Cox, quickly found us a great sublessee, a dot.com company to use our space as offices during a growth spurt for the remaining 3.5 years of our term. In fact, Don was so fast, we had not yet even found a new home for ourselves! So we packed up our goods and fixtures real snug and moved completely offline into some teeny vacant space around the corner behind Katz’s. Finally, after three months, our search yielded an amazing new spot: 721 Congress Avenue, the Main Street of Texas, right next door to the historic Paramount and State Theaters! It was a fabulous open building with huge display windows that wrapped around it’s great corner location at 8th. It even came with a 60+ year retail history as the home of locally-owned Reynolds-Penland men’s store, a predecessor to today’s Keeper’s (6th & Congress). The Stephen F. Austin Intercontinental Hotel was not there yet, but we knew that our friend, Tom Stacy, would not rest until he got that derelict building at the other end of the block completely remodeled and open again. Wild About Music had an excellent 8-year run on Congress, growing together with the resurgence of downtown as a whole during Kirk Watson’s energetic mayoral reign. We found profitability and success there despite nearly being driven out of business by our landlord — who was the neighboring State Theater (pre-merger with the Paramount) — when they intentionally busted through the common wall into our leased space with a crazy expansion idea for box seats during their renovation. But I digress; that’s a whole other story. We loved being in that 700 block of Congress — the only fully intact (both sides of the street) historic block left on Congress between the Capitol and the river, I may add. We had excellent synergy with concerts, plays and events at the Paramount, and enjoyed good camaraderie with fellow retailers a few blocks in both directions. We would probably still be there today had fate not struck again and our lease expire about the same time. The theaters (merged by then, along with the ownership of our building) had fallen on some hard times financially and our building was put up for sale. With hopes of maybe owning our own real estate and getting out of leased-space vulnerability, we planned to buy the building ourselves. But the location ended up getting cleverly bundled together at auction with undeveloped overhead “aerial rights”. That put the bid pricing at more than double fair market value for just the land and existing building, thus also way out of our price range. It forced the sale into the hands of a developer who had visions of million dollar condos stacked eight floors high and a big fancy steakhouse right where we sat. He couldn’t wait for us to have to vacate, coming in the very next day and gutting the space. And that’s how it remains to this day: sadly empty, not even a fresh coat of paint on the outside in 14 years, dirty windows, and absent a few nice temporary displays to help brighten the corner and the rest of that wonderful block. It’s a fitting monument to when development gets ahead of reality…runs over yet another iconic local business…and then the new building owner doesn’t even have the pride and decency to maintain his building in a manner worthy of being on The Main Street of Texas. But hey, that saga ended happily after all — at least for us. With contents once more loaded onto moving trucks and, once again, no new downtown home yet secured, we landed in our current funky, multi-level space in the Littlefield “Mall”/Garage/Apartments on a prayer and a lease done on a scrap of paper in about 20 minutes. No joke. Although quite nervous about the term (or lack thereof), the next day we were in there painting and arranging. A few weeks later Wild About Music re-opened downtown for the fourth time. An interesting sidenote: This also happens to be the very same spot (but in a previous building that stood there) of the original location of Austin’s famed Antone’s Home of The Blues, and the adjoining OK Records. Here a young Stevie Ray Vaughan posed with his guitar out front for a classic Austin Chronicle photo that also later became the album cover of Blues At Sunrise. Somehow we have managed to last for almost 6 years now on those month-to-month terms. (Please, someone, knock on wood.) This despite four changes of building ownership over the first four years. During two of those painful interim holdings we were told we were soon going to be history again. Once to be replaced by a high-end spa and salon to service an upscale South Beach Miami boutique hotel; clearly “WAM did not fit that formula,” we were told. Then, later, another threat by a Walgreen’s coming to invade historic Sixth Street via our space — yes, I know, pathetic, aye? — because “a national-credit tenant could pay far more than a little local business,” said yet another very important leasing agent. Fortunately we now find ourselves in the care and attentive property ownership of T. Stacy & Associates and their great staff. We know full well that handwriting is on the wall and another move still looms large in our future. Our block has been designated for some very intensive redevelopment one day. Some of it would have already begun had the recession not intervened. But at least with Tom Stacy on the other end, we also know that we will have loads of advance warning and likely plenty of helping hands to make sure we do alright in any transition. Perhaps we might even end up right back in the same spot post-redevelopment (if we could survive an interim solution half intact). Alternatively, our hope is to find Wild About Music a permanent home within one of the amazing old buildings of East 6th’s majestic Historic & Entertainment District — to experience a return to the days when buildings like those on East 6th were, in fact, owner-operated buildings and businesses. As a visitor to the street you should be able to evidence an O&O shop by the pride exhibited in the fastidious exterior presentations, the warmth and genuineness of the interior business offerings, and the down home friendliness of the proprietors and staff. That’s why I serve on the 6ixth Street Austin board. That’s why I and my fellow board members are so passionate about the renewed vision for this street. That’s why we and a handful of fellow dedicated E.6th property and business owners are working tirelessly to bring about much needed change to the street after two decades of dirt, neglect and despair. Sure, it’s still fairly dowdy in spots right now. And we know we need additional quality daytime offerings like more shops and galleries, a few more unique eateries, and more live music venues back on the street. But we do have a vision: to become the premier destination for the best of Authentic Austin owned and developed businesses to be found anywhere. And, importantly, a plan (to be discussed separately) to get there. Fred Schmidt is co-owner, with wife and business partner, Shelley Meyer, of longtime Downtown Austin retail stores Wild About Music Art & Gift Gallery (26 years) on Congress Ave, and Toy Joy (29 years) and Austin Rocks (5 years) in the 2nd Street District. Concurrently he is also Director of International Affairs at Capital Factory, Austin’s premier incubator/accelerator facility for startups, already located in the proposed new Innovation District in the northeast quadrant of Downtown. He has served as a past board member of the Downtown Austin Alliance (DAA), the Downtown Austin Neighborhood Association (DANA), and 6ixth Street Austin. He thinks this is one of the best places in the world to live, work and play! Disclaimer: The views expressed herein are solely those of the author and do not reflect the positions of any affiliated organizations. Excellent history! Thanks for the fascinating info. Every time I see 721 Congress I imagine it being an old fashioned diner. You know, pancakes, waffles, eggs and bacon, coffee in the morning. It just looks like that to me.